Our Spin-e-fex Snowflake templates are so easy to use. The etched markings are easy to see, Westalee and the unique Key Gate System allows you to place the Ruler Foot inside the template and then close the opening. This prevents the template from expanding as you stitch and does not leave you with a flat spot in the stitching where you stitched past the opening. 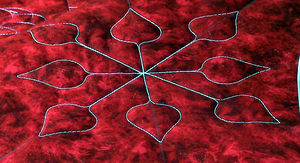 With a set of 2 tools you get 4 keys making it possible to quilt 4 different sizes for each of the Snowflake templates. The measurement is the outer edge of the circumference of the circle the Snowflake fits in. 5.5" 7.5" 9.5" 11.5" but not limited to these sizes. You can easily vary the size to suit your design. Quilters often look for that something special when quilting for themselves and or their customers. Our Spin-e-fex range of tools will give you more flexability than ever before. Templates that are designed for 12" blocks and borders down to 3", they are readily at home with Gammil, Nolting, A1, APQS, Handi Quilter, ABM and more. Using our Stitching Line Discs, the templates can be used to draw your own designs directly onto fabric for Hand Quilting or to be sewn with your Sewing Machine. Spin-e-fex templates are made from up to 6mm clear cast acrylic, have multiple reference lines and have been sized to enable easy handling when stitching. The Templates are cut to suit the make of Long Arm Machine, if your Longarm machine is not listed here, please contact us. We can supply other sizes and can even custom make new shapes. The list of Long Arm and Mid Arm Quilting Machines is ever growing and the size of the hopping foot and its suitability for use with templates varies. The Spin-e-fex range of tools are custom laser cut and manufactured to suit your machine. 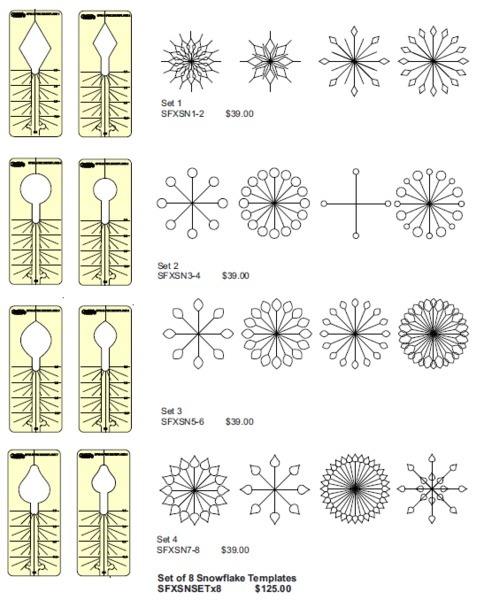 Westalee WTSFXSNSETx8 SpinEFex Snowflake Ruler Template Set of 8: 5.5 to 11.5"
Very good selection of Westalee rulers and templates, fast shipping! only positive comments for AllBrands.com. I always find what I need. I love your prices and the service is always fast. I always get a friendly and fast response to any questions I have. Thank you. High Or Low Or Longarm Shank? Are you using an adapter or Bernina #72 foot?